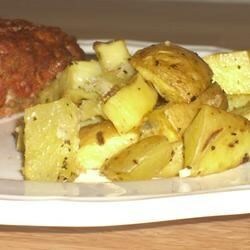 "I came up with this recipe as a great way to make potatoes new and exciting. They come out tender, crispy, and full of flavor." 1Preheat oven to 375 degrees F (190 degrees C). 2Place the potatoes, minced onion, parsley, garlic powder, seasoned salt, pepper, and olive oil in a large bowl; toss together until potatoes are evenly coated. Spread potatoes in an even layer on a baking sheet lined with aluminum foil. 3Bake for 20 minutes in the preheated oven; flip the potatoes and continue to bake until tender, 20 to 25 minutes.